While we fulfilled our main goal for this trip on Friday when we celebrated the completed makeover of all the classrooms at Tia Tatiana school, we also wanted to spend some time with the children and young adults living at the Remar orphanage. We thought it would be great to meet with both the boys and girls and find out from them what they felt were the most pressing needs at their home where 40 boys and 20 girls ranging in age from 3-18 live in three separate buildings--one for all the girls, one for the younger boys and another building for the older boys. When we arrived at Remar, two of the older boys were chopping down the growth between the girls' house and the "sports field"...with machetes. 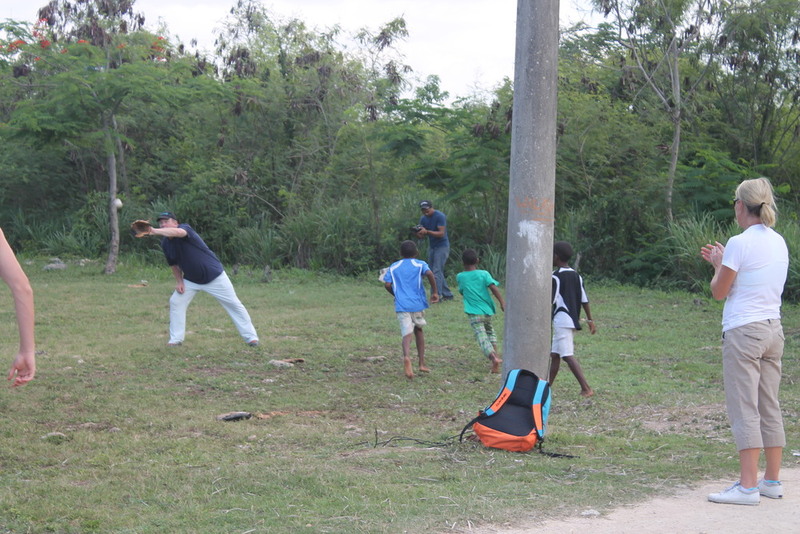 Close by, some of the younger boys had a spirited game of baseball going on. We were happy to see they were using the same gloves and balls that the Notre Dame baseball players had given us to bring on our last trip. On this visit we had a professional videographer with us to capture the life at Remar and to document our conversations with the children. We sat down on the rocky ground with the boys and had them tell us about what it's like playing out on their field. They showed us bruises and scrapes from falling on the rocks and the cuts on the bottom of their feet from the glass and other debris that's been a part of this field for years. We went inside and they gave us a tour of their house and said they would love to have a stove where more than one burner worked. They showed us the kitchen sink that was missing a plumbing hook-up and told us they wish they didn't have to carry buckets of water into the bathroom to pour into the toilet to make it flush and they told us they'd like to take a shower instead of having to throw buckets of water over themselves in the tub. Basically, the young boys have no running water in their house. Then we visited with the girls in their house. We found them at work sorting bags of clothes in a room upstairs. The orphanage raises money by running a store down the street where donated items are sold. For our chat, we sat with the girls in a different room up another flight of stairs. About 15 girls squeezed together on two couches to talk to us. We started with the same question we asked the boys: "Tell us what you like about your home here and tell us what you wish you could change." While the boys were all quick to give us their opinions and requests, the girls were very shy. So we changed the topic to who is good at what--we found out who the best cook is, who the fastest runner is, who the best artist is and that girl brought us her sketchbook with her fashion design ideas. We found out who was the biggest trouble-maker...and Nelson used it as a teaching moment and told the little girl not to be embarrassed about that, but to know that often- times it's the ones who rebel a bit who make the best leaders. In the course of everyone loosening up, we found out that unanimously what they all wanted most were musical instruments and someone to teach them how to play them. They all said they loved to sing and some wanted to learn guitar, others drums, some the piano, another the violin. They also admitted they would like to have pans to bake cakes and an oven that worked (they only have a stove top). Their other request was for a sewing machine. At both meetings, Jay and I told the children about Nick and how he brought us to the Dominican Republic. At the end of each of the conversations with the boys and the girls, Nelson asked if one of the children wanted to lead a prayer. Gabriel, a 10-year old boy, said an incredibly heart-felt, extemporaneous and deeply sensitive prayer and we experienced a similar devotion from the young girl who volunteered after our meeting with the girls. In both prayers they mentioned Nick and asked God to bless and strengthen Jay and me and to bless our families and friends and to help us in our work in the Dominican Republic as well to give us a safe journey home. It became very clear our two priorities here are running water for the boys and a safe field for the children to play in with a third possibility of providing for some musical instruments and music lessons for the girls.